tiny arm media – Page 2 – tiny media. big results. I used to travel a lot for work. At least three times a month, I was off to some other time zone in some other state, or occasionally, some other country. I became intimately familiar with an array of airports: JFK, LGA, DCA, IAD, DTW, ORD, SDF, and of course my home base of CHS. Marketing in airports is nothing new. You’ll see signs for local tourist attractions and restaurants, B2B companies trying to tap in to business travelers, and any manner of ads for shops or bars within the actual airport. 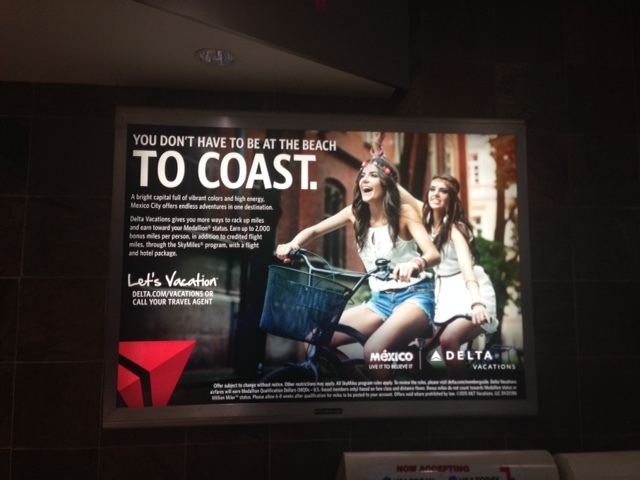 You can see one example of an airport advertisement that I snapped in ATL just this past weekend. Right next to this ad, however, was the following display. There is a stark difference between a still and a moving ad. as we learned with the advent of movies and television. What makes this ad stand out more, however, is that it’s interactive. The screen can be touched to bring up different features of the watch and can highlight other selling points. By targeting airports, where many business commuters pass through, Samsung knows that the ad might make them stop and think about how a smartwatch could improve their work efficiency while traveling. Hey there. Welcome to Tiny Arm Media. My name is Tricia, and I’m a graduate student at West Virginia University pursuing my Masters in Integrated Communications. This blog is an opportunity for me to share my insights from the Emerging Media class that I am currently enrolled in. I’d like to spend a little bit of time now talking about what emerging media is, why it matters, and just how prevalent it is in our world today. In truth, emerging media is the term for whatever new or innovative form of media is fresh on the market! That means that it’s an ever-changing term, as just like a vehicle depreciates the minute that you drive it off the lot, whatever media is emerging today could be outdated and obsolete tomorrow. Today, we can pin down the latest emerging media tools as things like mobile messaging apps (Kik, Snapchat, Viber, WhatsApp), blogs, social media sites (Facebook, Twitter, Instagram), and others. These emerging media tools are becoming some of the fastest, easiest ways to meet certain market segments. According to a Pew Research Center study, “36% of smartphone owners report using messaging apps such as WhatsApp, Kik or iMessage, and 17% use apps that automatically delete sent messages such as Snapchat or Wickr.” In addition, “72% of online adults are Facebook users, amounting to 62% of all American adults,” while “59% of Instagram users, 27% of Pinterest users and 22% of LinkedIn users visit these platforms daily.” The numbers speak for themselves! If you want to reach some of these marketing segments, you need to be where they already are. And it truly is everywhere. Census studies have shown that Internet use and smartphone use are increasing constantly. In a press release from the U.S. Census Bureau, researcher Thom File said, “Going online is no longer a simple yes or no proposition. Different groups of people are accessing the Internet in very different ways, and these statistics give us a better understanding of how and where those connections are taking place.” Because the Internet is at the center of these emerging media tools, the insight gained from these types of studies can help marketers best learn how to leverage these tools to reach the markets that they’re looking for. In the coming weeks, I’ll be exploring more specific emerging media trends and tools. I hope to examine how they are affecting both for-profit and non-profit organizations, as well as how we can try to predict and understand the latest trends before they become over-saturated. I look forward to your comments and feedback!